Learn how power travels from a generation facility to your home. One of ENMAX Energy Corporation's key strategies is to further develop the natural gas and renewable components of our generation portfolio. 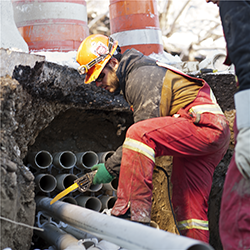 Installing underground cables in Calgary without impacting the CTrain. ENMAX Power Corporation provides customers with reliable, high-quality power. Power interruptions including unplanned and planned interruptions, sometimes occur, though, for a variety of reasons. For updates about current outages, visit our outage information page. If you are a member of the media and are looking for information regarding a power outage, please visit our media centre. For emergencies, call 403-245-7222 in Calgary or 780-420-5585 in Edmonton. For all other Alberta locations, call 1-800-511-3447. Those who live outside the Calgary service area have a different Wires Service Provider.